As we fumble our way through action and strategy games on our touch-screen devices, it's easy to lose track of the simple, sublime joys of touch. We get so caught up in rules and mechanics, learning unit strategies in Amoebattle or finagling bullet-time in Max Payne Mobile that we forget that the joy to be found in the simple act of touching the screen, of manipulating a game as if it were beneath our very fingers. Windosill for the iPad constantly reminded me of how wonderfully tactile the iPad can be. It's a lovely, humorous, mysterious game, and it completely took me by surprise. In addition to the iPad, it's available for PC via Steam (you can get it as part of the Humble Botanicula Debut bundle), but playing it with a touch-screen feels so good that it'd almost be a shame to play with a mouse. It's not on iPhone, as it probably wouldn't work on such a small screen. Windosill is more or less a puzzle game, though it's as much about simple play and understanding as it is about analysis or problem solving. 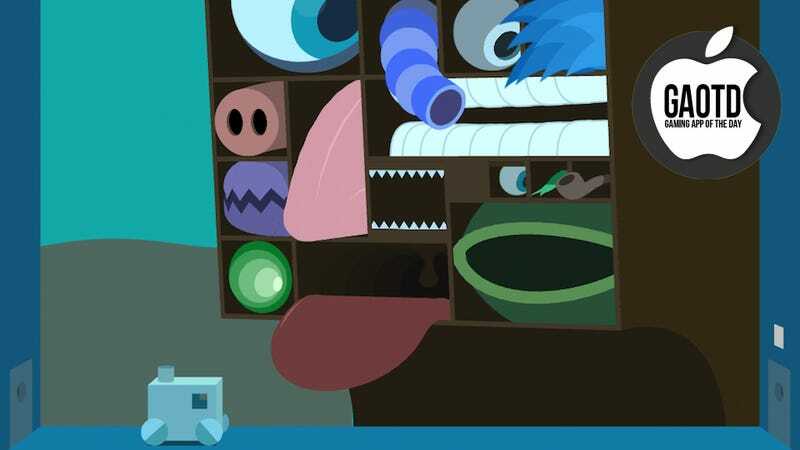 Fittingly, the game begins with a toybox—you'll be disoriented at first, then come to realize that you can manipulate everything on the screen. However, not all of those things are required to progress—they're simply there, begging for you to touch and squeeze them. A clock, a plant; a light, a squishy thing with an eye on top. And at the bottom of the screen, a little toy car. That car is what you must push from room to room; each room has a door in the wall that can only be unlocked by inserting a cubical key into a square lock above it. To get the key, well… you have to discover the room's secret, is the best way I can put it. The main character isn't really the car—the main character is you, and the car is just the toy you've chosen to take from room to room. The rest of the objects are what you'll have to manipulate to get where you're going. An example: in one room, you have a couple of different towers, and a stack of big blue cubes far too large to serve as a key for the locked door. You find you can push the stack of cubes over, which reveals a pool of water in the background. In the water is a globe, which you pick up with your finger and place on top of one of the towers. Once it's on top of the tower, you can spin the globe, which causes the wind in the room to pick up. The second building turns out to be a smokestack, and squeezing it creates a cloud… which you can then manipulate with the wind by spinning the globe… and tap the cloud to get it to rain cubes… one of which you can then have another building kick over to land on the ground before you use it to unlock the door and proceed. Oh right, I forgot to mention, one of the buildings sprouts legs when you spin it. Did I mention this game is mysterious and lovely? It is. Also, the next room will be something completely different. Maybe a huge box that grows interactive facial features depending on where you touch it. Maybe not. Windosill a game that must be played to be understood, and explaining the various rooms to you would do both you and Windosill a disservice. Learning how the game works, it turns out, is the game itself. I'll leave it at this— Windosill isn't like anything I've played on the iPad before, and it proved to be a delightful, playful surprise. Give it a shot, and you'll be glad you did.